Not going to lie a good 80% of my lipstick collection consists of Berry tones so it was surprisingly hard to narrow it down to just nine. Some that were chosen are old favourites and some are more newer products that I've added into my collection over the past while. So I narrowed it down to 6 lipsticks, 4 mattes and 2 creamy finishes along with 3 liquid lips so that I'd have a good mix of everything. Starting with the front row I've proudly displayed my Mac lipsticks. Confession time coming up I only use my Mac lipsticks when Autumn time comes around and I don't really know why. Starting from Left to Right we have Hearts A Flame, Viva Glam Ariana Grande I and Lingering Kiss all which are of a matte finish. Although I absolutely adore these shades like they honestly just scream Autumn/Halloween to me but my god do Mac matte lipsticks hurt my lips. I just find them beyond drying and have to lash on the lip balm before daring to even apply these. Although totally matte meaning they don't tend to bleed I still have to wear a lipliner with them just because of such the bold colours if you apply it messy in anyway you're able to see the mistake from a mile away. The second row consists of two Smashbox Lipsticks and one of the Rouge Velvet Bourjois lipsticks. The Smasbox shades I've chosen are Chestnut (on the left) and Maniac (on the right). I adore Smashbox lipsticks and honestly would rate them as one of my favourite formulas. No matter if their matte or a creamy formula both leave my lips feeling surprisingly moisturised. Also their lasting power is quite reasonable and you can go about your day for a few hours before having to re-apply. The Bourjois Rouge Velvet in shade 11 is absolutely beautiful. Also the quality of these lipsticks still have me shook! Although it's a matte formula the lipstick itself is so creamy and applies so easily and honestly I just can't get over it. I've done a little review where I raved on and on about everything about them which you can find here. 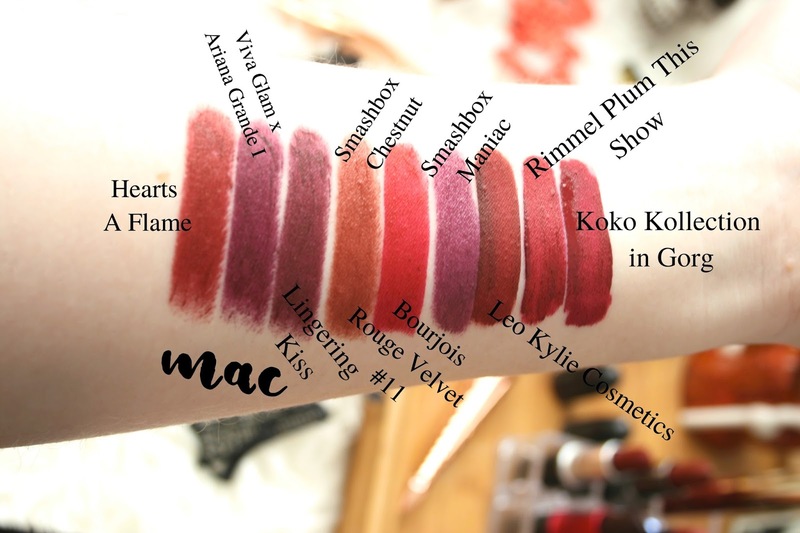 But honestly if you come across these and haven't swatched them yet, I 100% recommend you do so because ya'll need to see how insanely creamy they are while still being matte. Finally at the back row currently live my Liquid lipstick picks, consisting of two Kylie Cosmetics and a Rimmel Stay Matte liquid lip. Firstly from Kylie Cosmetics on the left is 'Leo' and then on the right from the first KoKo Collection 'Gorg'. Although I adore Kylie Lipkits (I used to be obsessed with them and for almost a year they were the only lip product I'd use, I've finally gotten over that stage) I do find her dark purple shades are a tad patchy so usually I do have to put on two layers of these two colours for a full coverage lip look. Although they do go patchy 9 times out of 10 the colours of both are just so blooming gorgeous I just couldn't not have them in my Autumn lip wardrobe. Finally I added in a Rimmel Stay Matte Liquid Lipstick in the shade 'Plum This Show' which again is such a fab purpley red toned shade but again it does go slightly patchy. Purple toned liquid lips must be very hard to formulate because most of them I've tried go patchy 5 minutes after application or an hour after application. However again because the colour is way too nice not to include it in my picks I just kind of get on with the patchy parts. I must admit this has great staying power and you don't even feel it on your lips when you're wearing it. 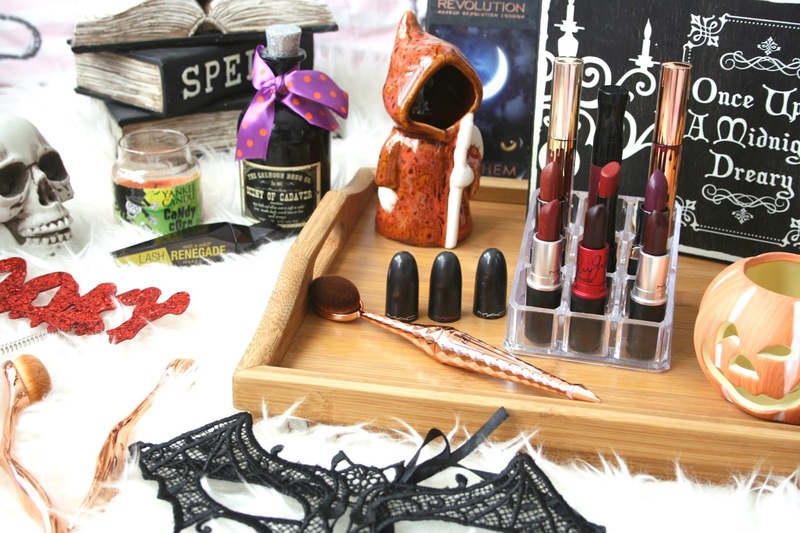 Have you picked out your must have Autumnal lip shades yet or am I just a tad bit too excited!? Such gorgeous picks for Autumn, I'd love to try the new Bourjois lipsticks! 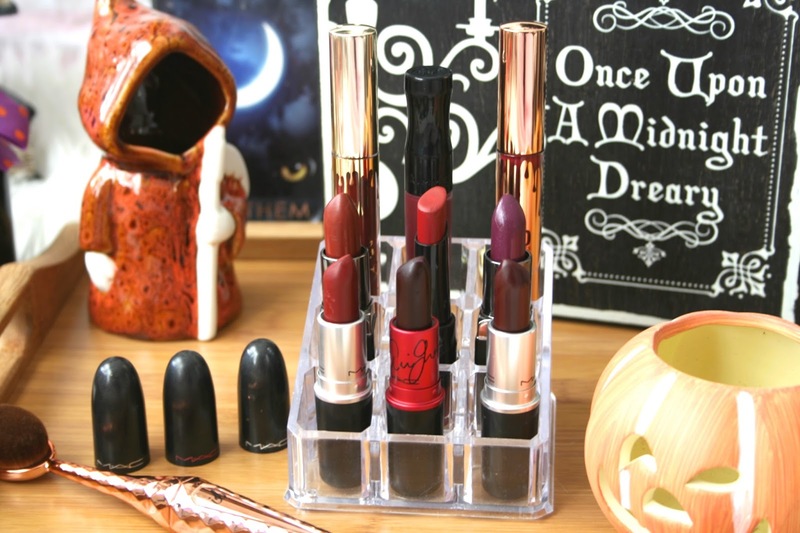 These shades are so perfect for fall! Love 'em!